Revisionist and reverent at the same time, the new film “Mary Magdalene” also feels like an effort at rehabilitation, not that such is really needed: The Vatican declared Mary “Apostle of the Apostles” in 2016, officially reversing the libel by Pope Gregory (who had declared her a prostitute), making her celebration a feast day and placing her second only to the Blessed Mother among the ranks of Jesus’ female disciples. It will come as no surprise that “Mary Magdalene” serves as a feminist parable too. The film will also be for some an overly solemn affair: spare in its aesthetics, near-sepia in its palette and very much about the rustic place and time it wishes to recreate (Judea, 33 A.D.; filming took place mostly in southern Italy). It spends quite a bit of time upfront establishing Mary (Rooney Mara) as a special personality, special in a way that drives her family mad. She is simply not one of them. When she balks at the idea of marriage, her father and brothers drag her to the sea and attempt some manner of early Jewish aquatic exorcism: She must be possessed by demons, they moan, while nearly drowning her. When she is first confronted by Jesus (Joaquin Phoenix), it is a marvelous moment of realization and intoxication, albeit one-way: When their eyes meet, his are impassive, but the reaction Rooney delivers contains awe, joy and instantaneous conversion to the cause. Jesus is asked, “Would you take a daughter from her father?” To which he answers, flatly, and with no room for paternal argument, “Daughters from fathers, sons from mothers.” Mary has left the building, such as it is. As regards acting, this is Rooney’s movie, of course, and she delivers a passionate, thoughtful, convincing performance. Despite a number of film portrayals (including one by Italian bombshell Maria Grazia Cucinotta in the 2000 production “Maria Maddalena”), Mary doesn’t have the filmography of Jesus, whom Phoenix plays with a perhaps predictable level of eccentricity. But he is also fierce and believable and different enough to pique the viewer’s intellectual curiosity. No performance can “capture” Christ. But an interpretation confined to stained-glass iconography is of little use to us—if, in fact, a movie is supposed to help us better understand the human Jesus. And why else portray him? The embellishments applied by the actor and director Garth Davis (“Lion”) are bold. There is a streak of madness in Jesus, a physical draining of his strength when he raises the dead and an almost sarcastic attitude when he confronts the merchants at the Temple, which he tries to tear apart with his bare hands. It is a Jesus who cures and comforts. But who also, occasionally, seethes. Why is a 1960s film about a nun still controversial? Mary, for her part, instructs; she is Jesus’ best interpreter, though the fraternity of Apostles she joins does not quite open its arms to her. Peter (the consistently wonderful Chiwetel Ejiofor) is dubious and a bit apprehensive about everything—he knows what is going to happen come Passover. The starry-eyed Judas (Tamar Rahim) is the most welcoming and the most provocative characterization by the screenwriters, Helen Edmundson and Philippa Goslett. Drunk on faith, Judas betrays Jesus in order to force his hand: Once the Messiah is arrested, Judas thinks, he will have to bring down a rain of heavenly destruction on the Romans. The Apostle, needless to say, is bitterly disappointed. When a movie has been on the shelf for a bit—the shooting of “Mary Magdalene” concluded in 2016—the assumptions about its prospects are decidedly negative. But the “Mary Magdalene” delay is about timing, luck and current events: The Weinstein Co. was supposed to distribute the film, but the Harvey Weinstein debacle derailed that plan. 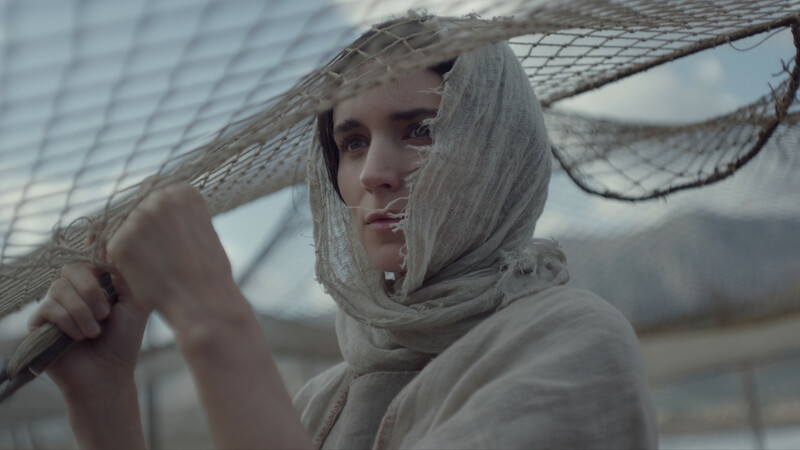 Being released at last by IFC Films, “Mary Magdalene” is in many ways an act of love, an effort to tell its story both freshly and honestly, with fidelity to Scripture. There seems to be some conflation between the stories of Jesus raising Lazarus and his raising the son of the widow of Nain, but hey, a little dramatic license can be forgiven. Forgiveness, after all, is what the movie is all about. Saint Mary Magdalene - Pray for us.